This week WEBS Education Manager Amy Greeman is in the studio with Interweave Content Strategist, Lisa Shroyer. 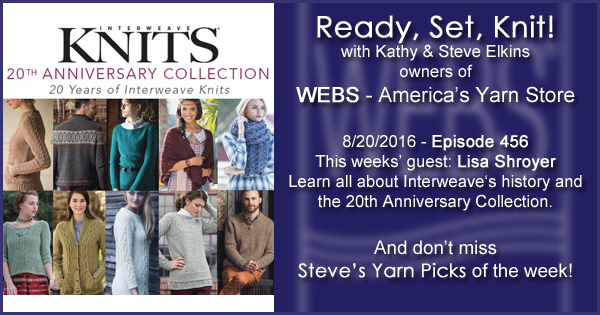 Interweave Knits recently celebrated their 20th Anniversary, with an incredible collection of patterns! Amy and Lisa talk about how it all came together and how Interweave has influenced the industry over the years. Fall Classes are live on the website! Register now online, in-store or by calling our Customer Service department. Today is the last day of WEBS Tax-Free weekend! Visit our retail store, buy anything taxable and we’ll refund the tax in your purchase! It’s not too early to book your seat on the bus to Rhinebeck! 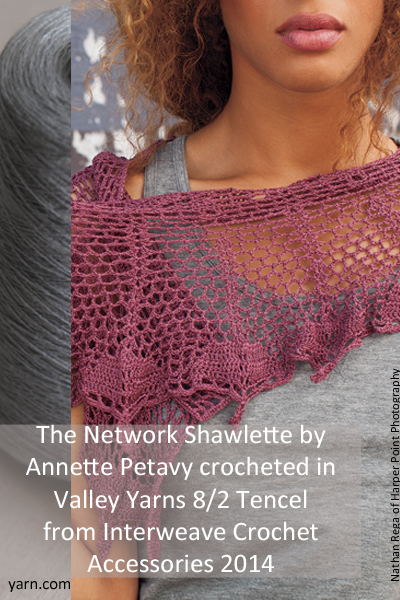 Valley Yarns in the new Interweave Crochet! 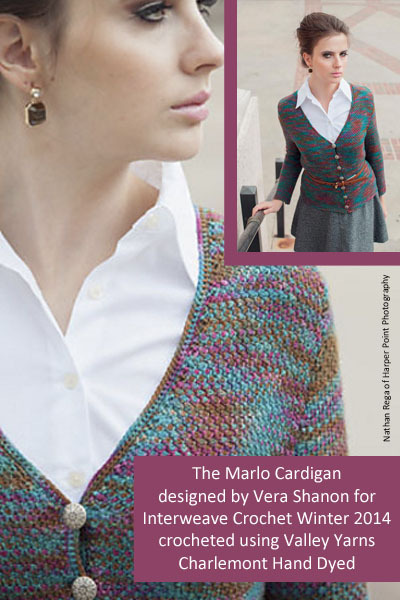 The Winter 2014 issue of Interweave Crochet is out and we are loving the Marlo Cardigan designed by Vera Sanon. Tunisian honeycomb stitch, worked in Valley Yarns Charlemont Hand Dyed produces a textured fabric with drape, that resists curling and has minimal finishing. Which Color of Charlemont Hand-Dyed will you be using? The new Winter 2014 issue of Interweave Knits features a gorgeous sweater designed by our friend Amy Herzog. The Telluride Aran sweater features a central cable panel with deeply ribbed cuffs and hem and is knit with Valley Yarns Northampton in the Pacific Teal colorway. Which color of Northampton would you choose? With the Thanksgiving holiday not yet 24 hours behind us some of you have kicked into overdrive to get your holiday gift knitting finished. 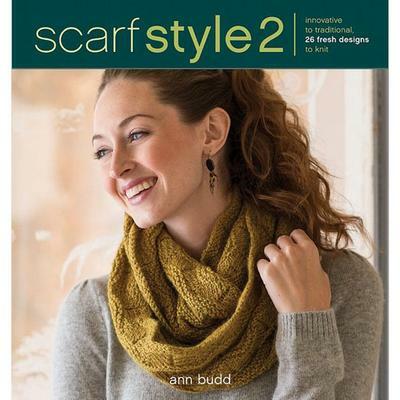 Ann Budd’s new book, Scarf Style 2, is a great resource for smaller, fast and yet beautiful knit gifts. Whether you’re a fan of cables, fair isle or brioche, cowls, shawls or scarves this book has something for everyone! 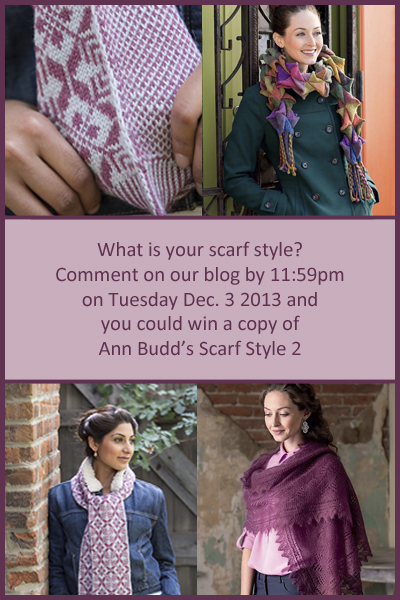 Leave a comment below and tell us which scarf is your style and you could win a copy! All comments must be posted by 11:59pm EST on Tuesday, Dec. 3. Please make sure to leave us a way to contact you if you win! The winner will be drawn randomly and posted here the following day. Congratulations Diane! Keep an eye on your inbox, we’ll be contacting you soon. Coned yarns aren’t just for weavers! Yarn presented on cones tends to be finer in gauge and comes with a ton of yardage which makes it great for crochet projects. 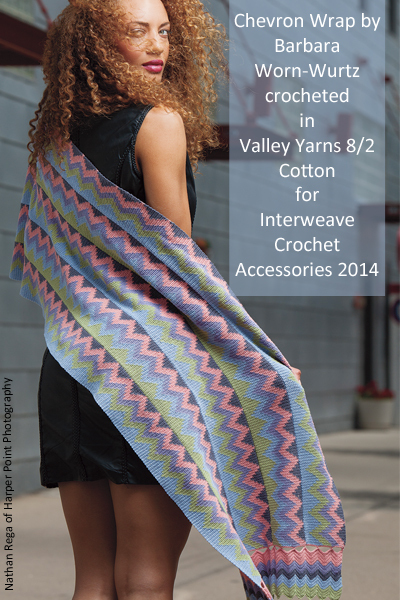 Interweave Crochet Accessories 2014 issue is out and features 3 designs using Valley Yarns that are available on cones. The Network Shawl is made using our 8/2 Tencel in the Greyed Mauve colorway. The Chevron Wrap uses our Valley Yarns 8/2 Unmercerized Cotton in 5 colors: shale, peaches ‘n cream, greyed lavender, willow green, and heather. 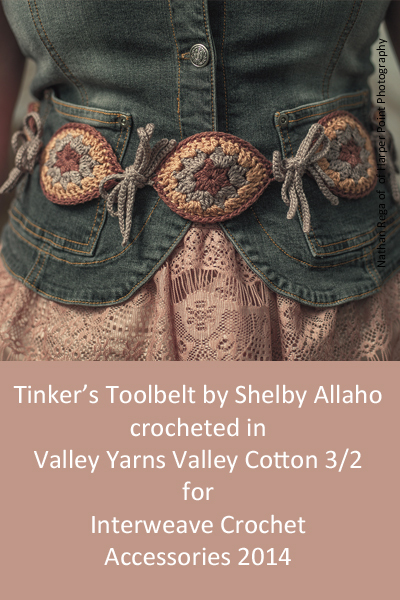 The Tinker’s Tool Belt uses our Valley Yarns 3/2 Cotton in 3 colors: madder brown, sponge, and amber gold. Which projects are you excited about getting your hooks into? This week we’re excited about the color play in the newest book of patterns from Martin Storey, Scottish Knits. In Scottish Knits, Martin Storey pays homage to beautiful Celtic cables and colorwork with 17 stunning and innovative handknits accessible to knitters of all skill levels. The projects include garments, accessories and home goods, many of which feature different color patterns or textures within a single piece. Scotland has a rich tradition in handknitting thanks to the exquisite hand-dyed yarns that have been spun in the Scottish islands for centuries. Traditional techniques have been handed down through generations, resulting in a treasure trove of stitch patterns, textures, and colors. What happens when beautifully crafted handknits meet a Scottish sense of color and whimsy? 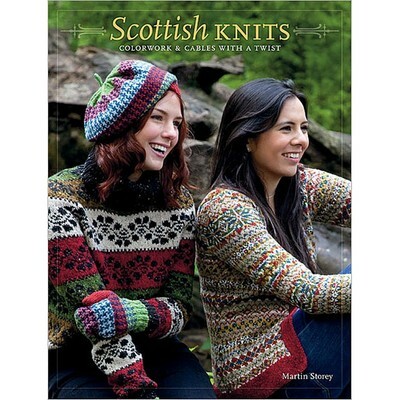 You get an exquisite book of Scottish-influenced designs that knitters will crave. 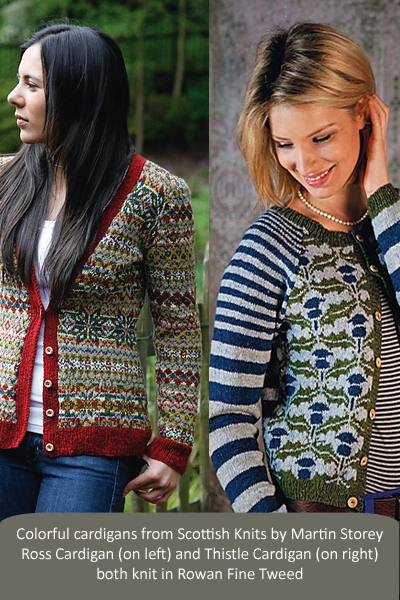 Leave a comment below and tell us what colors of Rowan Fine Tweed you’d use for either cardigan above and you could win a copy of Scottish Knits! All comments must be posted by 11:59pm EST on Tuesday, Oct. 8. Please make sure to leave us a way to contact you if you win! The winner will be drawn randomly and posted here the following day. Congratulations Ara! Keep an eye on your mailbox, your copy of Scottish Knits will be arriving soon. The 2013 issue of Interweave Knits Holiday Gifts is out and we couldn’t be happier. Our own Valley Yarns are featured in two projects! 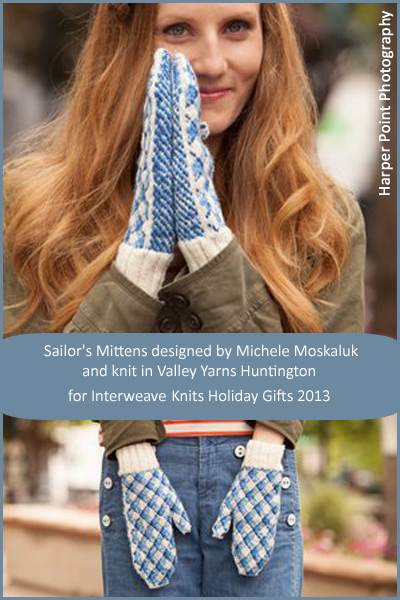 First up are the Sailor’s Mittens designed by Michele Moskaluk, and knit in Valley Yarns Huntington. Worked from the cuffs up with increases to form the thumb gussets, these women’s mittens boast lively three color patterns on the palms and backs of the hands. 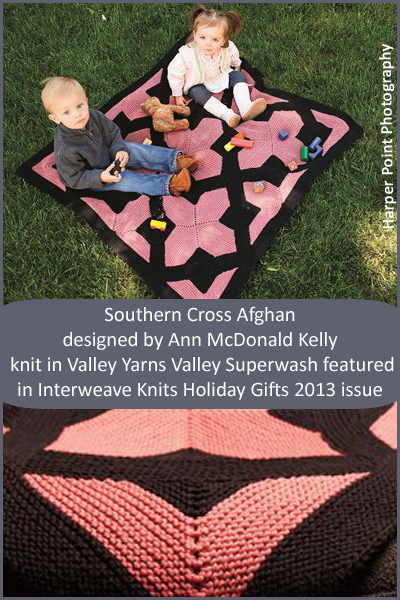 Second is the Southern Cross Afghan designed by Ann McDonald Kelly and knit in Valley Yarns Valley Superwash. This afghan is made of mitered triangles made into squares. The squares are then sewn together with borders, making an interesting and cozy blanket. Which projects are you excited to make as gifts this year? Interweave Knits has released it’s Fall 2013 issue and it features two great patterns using yarns from our friends at Tahki Stacey Charles. First up is the Crinoline Tee designed by Andrea Babb and knit in TSCArtyarns Tranquility. TSCArtyarns is a collaborative effort using yarns from TSC dyed in gorgeous colors by Iris Schreier of Artyarns. We’re loving the subtle, tonal stripes that happen with this yarn and the gentle ruching detail at the shoulders. Second we have the Mistral Stole designed by Susanna IC and knit in Filatura Di Crosa Nirvana. The modern yet organic stitch pattern is worked outward from the center for symmetrical edges. 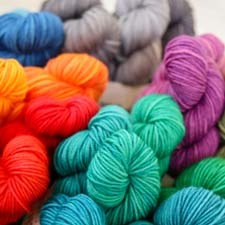 And if you haven’t yet tried Nirvana, you are missing out on an incredible, washable, lace-weight merino yarn! What projects are you looking forward to making from this issue? Interweave Crochet just release their Summer 2013 issue. The Palm Tunic, designed by Cristina Mershon, is crocheted using our Valley Yarns Southwick. Constructed from triangle motifs that come together in a great starburst on the bodice, and wide ribbed band at the hem, it’s perfect to slip on over a bathing suit or pair with a cami and flirty, summer skirt. Have you checked our the Summer 2013 issue of Interweave Crochet yet? Guest: It’s time for Kathy and Carol’s Annual Year in Review! 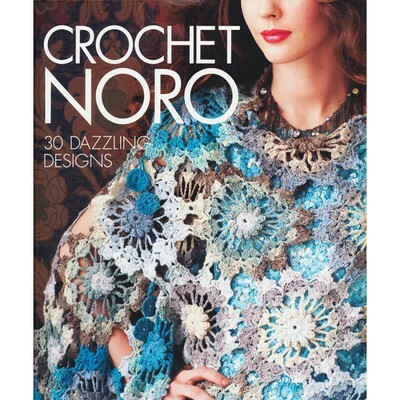 Kathy is excited about the resurgence of crochet with the special Vogue Knitting Crochet issue earlier this year and the new Crochet Noro book; just two great examples of crochet coming into it’s own. They also discuss a few yarn companies that closed their doors this year, the fashion yarn trend still going strong, trade shows and fairs, great books, the shift to digital patterns, social media marketing and more. WEBS Annual Year End Blowout Sale is happening In-Store through December 31st and online through January 1st. WEBS will be closing early, at 4:00PM, on 12/31 and will be closed 1/1 for the New Years holiday. Drop in starts up again on Tuesday, January 8th at 10:00am. 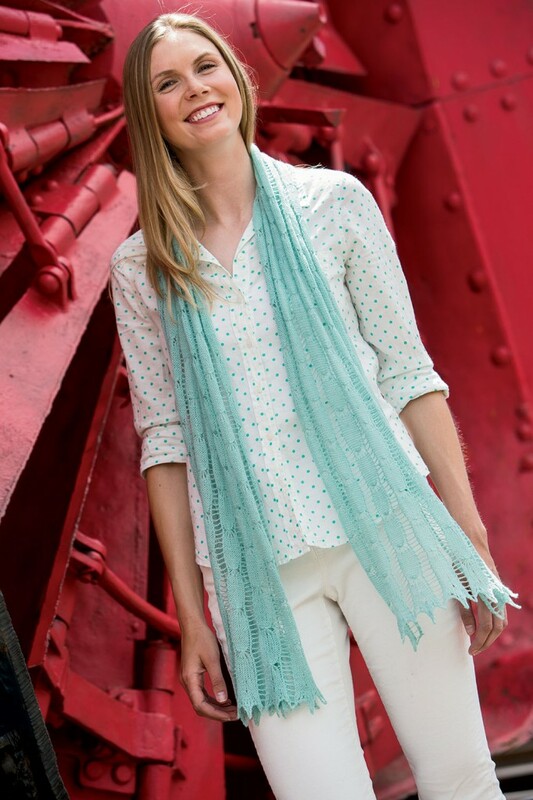 Classic Elite Yarns Shawls, Wraps and Scarves book launch on January 24th, register now.